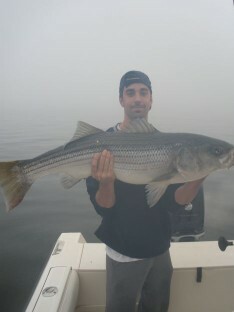 Free Fishing Reports > Northeast > New York > North Shore > Foggy Morning – Killer Bass Bite! Foggy Morning – Killer Bass Bite! Capt. Skip, Kristin, Andrew, Mike, and Joe crept out in the fog to an amazing bass bite. First fish of the day was a 44 in., 33 lb. slob caught by Andrew. 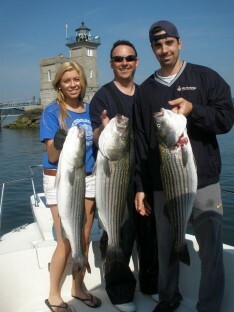 All others limited out in no time with fish from 13 to 25 lbs. 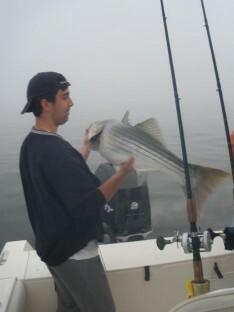 trolling and jigging. Seas were calm but the bass bite was great! Way to go crew! 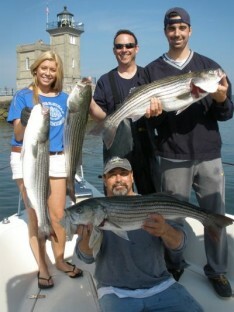 Kristin, Mike, Andrew, and Joe with today's catch!